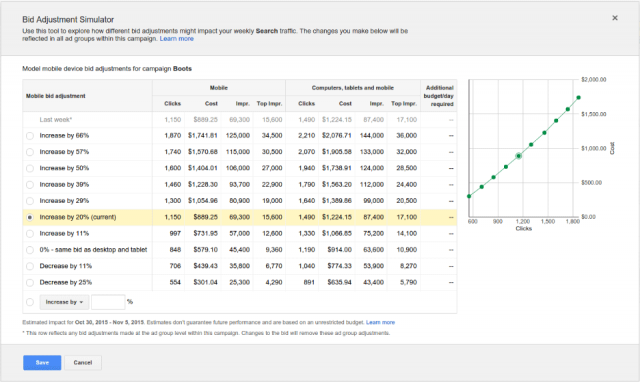 Google announced on Google+ two new simulator tools aimed at helping AdWords advertisers estimate the impact of changing their bids. The two tools are (a) mobile bid adjustment simulator and (b) first position bid estimates. The Mobile Bid Adjustment Simulator is used to compare the potential impact of different mobile bid adjustments on your weekly Search Network traffic. It also allows you to easily change your budget to accommodate that traffic. The mobile bid adjustment simulator maps the potential impression, click, and spend impact of changing your mobile bid adjustment. For example, let’s say you have a 20% mobile bid adjustment and drove 1,150 mobile clicks over the last 7 days as a result. Using the mobile bid adjustment simulator, you can see that setting a 50% mobile bid adjustment might have generated an estimated 1,600 clicks on mobile devices -- that’s 39% more mobile clicks and 450 more visitors to your website! First position bid estimates provide bid suggestions to help your ads show in the first ad position at the top of search results. These estimates are useful for advertisers aiming to maximize impressions for their brand keywords, or other high-priority keywords They also offer greater ad visibility compared to first page or top of page bid estimates.